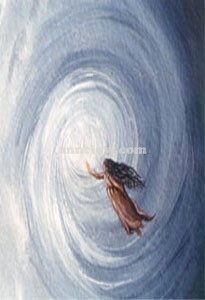 Into the Spirit This painting represents a vortex of enlightenment into which people of the world are being drawn. A higher awareness is being experienced, with new ideas swirling around them - ideas that are bringing positive changes into the world. Every thought, word or deed has a direct impact on ourselves and on the world.